Anti Inflammation - Are You Ready for a Change? It is becoming increasingly clear that chronic inflammation is the root cause of many serious illnesses - including heart disease, many cancers, and Alzheimer's disease. Inflammation appears on the surface of the body as local redness, heat, swelling and pain. It is the cornerstone of the body's healing response, bringing more nourishment and more immune activity to a site of injury or infection. But when inflammation persists or serves no purpose, it damages the body and causes illness. Stress, lack of exercise, genetic predisposition, and exposure to toxins (like secondhand tobacco smoke) can all contribute to such chronic inflammation, but dietary choices play a big role as well. Learning how specific foods influence the inflammatory process is the best strategy for containing it and reducing long-term disease risks. Foods high in refined sugars, gluten, dairy, vegetable oils (listed above), meats, fried foods, and fast foods can spur inflammation. They cause over activity in the immune system, which can lead to joint pain, fatigue, and damage to the blood vessels. 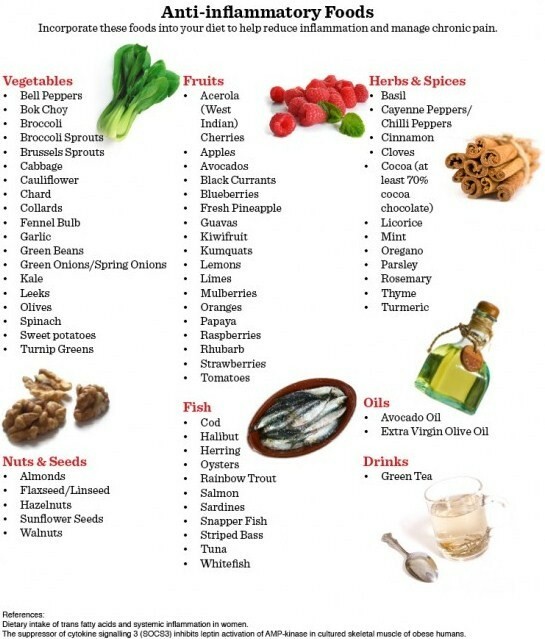 If you are looking for a real long and healthy life, anti-inflammatory foods are the key. 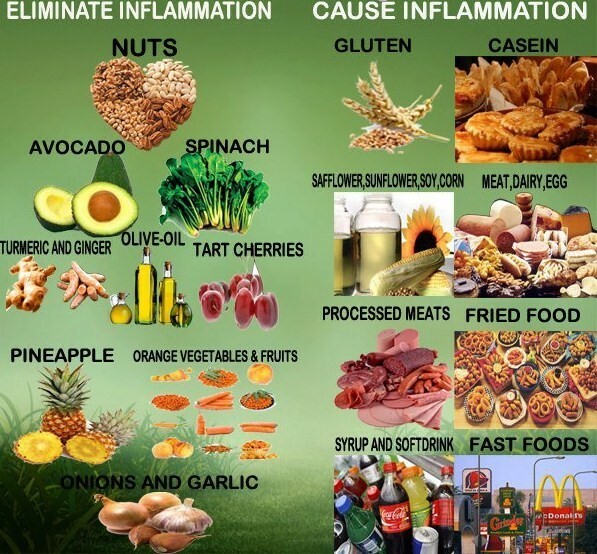 There is a great list of foods to choose from to achieve that help you fight against autoimmune and chronic inflammation disorders. The word inflammation is derived from a Latin word ‘inflammare’ that means ‘on fire’. It is a set of biological processes involving the natural reaction of our body to harmful stimuli, i.e. injuries, infections etc. Some degree of exposure to these stimuli is inevitable in our daily lives, and our body’s natural defense can fight those harmful elements to some extent on its own. Inflammation can be acute (short term) or chronic (long term). Acute inflammation is the body’s first aggressive reaction to extrinsic damage from which the body recovers in hours to days, for example insect bite, abrasions, hives etc. But chronic inflammation happens when the body’s defenses are continuously exposed to harmful stimuli, which renders the body and its defenses weak. Examples of chronic inflammation include tuberculosis, cancer, arthritis, dermatitis, inflammatory bowel diseases. Sometimes the body’s defense starts working against its own tissues, which leads to a number of diseases widely known as ‘auto immune diseases’. Also it is postulated that inflammation is involved in the ultimate process of aging as well. One wonders if somehow you could conquer aging, what a miracle would that be. Nature has given us some wonderful foods in nature and they can be used in your diet to defy age, also to help fight against autoimmune and chronic inflammatory disorders. These are the antioxidant, anti-inflammatory power sources effective against a number of diseases like acute traumas, injuries, arthritis, cancer, indigestion, acid peptic disease, dementia and many other chronic inflammatory conditions. Sweet potatoes (contains fiber, vitamin C and B6, beta carotenoids, manganese and carbohydrates) Salads, Chards, Green beans, Bell peppers, Kale, Bok Choy, Olives, Fennel bulb, Spring onions, Mushrooms, Leeks. Cod, Tuna, Herring, Trout, Salmon, Striped Bass, Halibut, Whitefish, Sardines, Snapper Fish, and Oysters are an excellent source of omega-3 fatty acids. These include most importantly eicosapentaenoic acid and docosahexaenoic acid. There are numerous benefits of omega-3 include a healthier heart by reducing the chances of heart diseases, preventing and fighting cancer, helping against autoimmune diseases and psychological ailments. All of these benefits result from its excellent anti oxidant and anti-inflammation properties. Olive oil contains an abundant supply of polyphenols and monounsaturated fats, which reduce inflammation in cardiovascular system including heart and blood vessels, which in turn reduces the risk of atherosclerosis and all the resulting complications. It also helps fight against Rheumatoid arthritis and allergic asthma by the same mechanism. Avocado oil is another, very effective anti-inflammatory agent, which is similar in composition and properties to the Olive oil. ﻿Coconut oil﻿ has many benefits as well as anti-inflammatory properties. Green tea is rich in flavonoids, which are a very potent agent in decreasing the incidence of heart diseases and effective against malignancies too. Kombucha is made with green tea and a very powerful probiotic. However, water is known as the simplest, cheapest and widely available drink. It has been shown in many studies that water accelerates the body’s metabolism and speeds up the removal of harmful by products of metabolism. We are not what we eat, we are what we absorb. There is no better choice than the anti-inflammatory foods in your diet to ensure a happy healthy disease free long life.